After ten years and over three billion miles of travels, the Rosetta spacecraft has entered the orbit of its comet destination, and all reports currently show the mission progressing as intended. Braking 62 miles over the surface of comet 67P/Churyumov-Gerasimenko, the Rosetta is set to inform humanity on many new discoveries, possibly even helping us understand how life developed on Earth. The oddly-shaped comet (referred to as a "rubber ducky" shape by some researchers) is the first to be this intricately analyzed. As reported by newswatch.nationalgeographic.com, one of the Rosetta mission’s principal investigators, Holger Sierks of the Max Planck Institute for Solar System Research, stated, “Today, we are opening a new chapter of the Rosetta mission. And already we know that it will revolutionize cometary science.” Sierks was impressed with the level of detail from the photographs of the comet's icy, rocky comet surface. A 220-pound lander named the Philae is set to descend from Rosetta and land on the comet on November 11th, the first such attempt in history. The Philae will be anchored by harpoons and in addition to photography, will be able to take drill samples and other scientific readouts of the comet's composition. Rosetta will remain in 67P's orbit for the next year, hovering as low as six miles to create topographical maps of the crater-flecked comet's surface. As 67P rounds the sun, icy elements in its geology will melt, and the subsequent geographical changes will be noted. The comet is visible to the naked eye, but watching the Rosetta blog might be easier. A closeup of 67P/Churyumov-Gerasimenko. 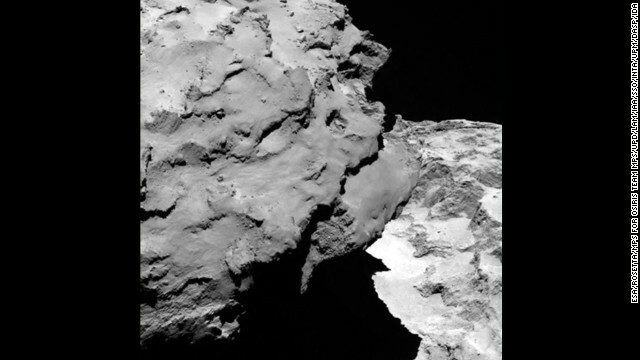 Image courtesy THE SPACECRAFT WE'RE LANDING ON A FREAKING COMET.